We started out wanting to snowboard all year, wherever and whenever we wanted. And so, we designed a board that gave riders the control of a snowboard on pavement. As Freebord has evolved, so has our goal: bring as much control as possible to riding on pavement. Our riders can carve, slide, slow down and stop whenever they want. They can go as fast or as slow as they want. They can bomb the steepest of streets or ride mellow cruisers; hit big open roads or the narrowest of sidewalks. On a Freebord, riders have the control they need to ride what they want and how they want. The deck of a Freebord resembles a large skateboard. Beneath the deck are four fixed wheels mounted on long trucks that extend beyond the board. These “edge” wheels simulate the edges of a snowboard and are used for carving. In addition to these four edge wheels, the Freebord has two additional “center” wheels on the board’s center line that rotate 360 degrees. These act like the base of a snowboard, allowing riders to initiate slides in any direction, check their speed or stop just like they would on snow. Bindings mounted to the top of the deck provide riders with added board control. 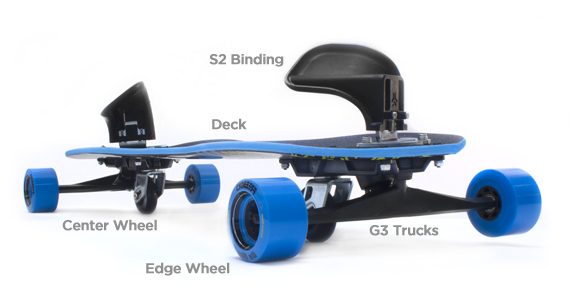 Like a traditional skate truck, Freebord’s G3 trucks are made up of a hangar and baseplate. The hangar on the Freebord is longer than what you’ll find on a traditional skate truck, but serves the same purpose. 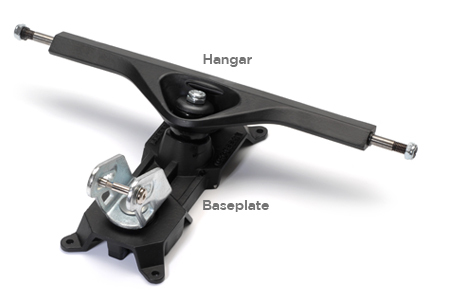 Freebord’s unique ride is made possible by a 360º rotating center wheel that is mounted to the baseplate on the underside of the board. The center wheels ride lower to the ground than the edge wheels, creating “rocker”, or space between one set of edge wheels and the ground. A Freebord “rocks” over the center wheels between one set of edge wheels and the other. This combination of the edge wheels and swiveling center wheels allow riders to both carve and slide. When a rider weights one side of the board (heelside or toeside), the opposite set of edge wheels are off of the ground and the board can then begin to slide in that direction. The weighted wheels will drag along the pavement, slowing the rider’s speed. As a result, riders can use slides to slow down, stop, navigate tight terrain, spin or drift between carves. Freebord’s S2 bindings are mounted to the top side of the deck. Like snowboard bindings, S2’s provide increased board control by allowing riders to transition from toe to heel edge wheels more quickly and confidently. They also provide increased leverage on the edge wheels when riders want to stop or slow down. They are rotationally and vertically adjustable to allow for stance customization, but unlike snowboard bindings, Freebord’s bindings do NOT lock a rider’s feet to the deck. Riders can step in and out of them whenever they need to.